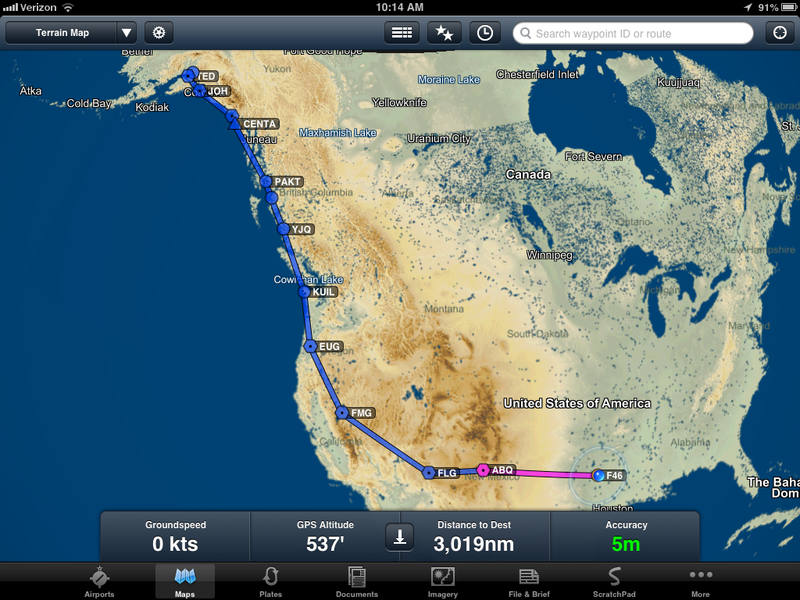 After answering the 3 basic questions (see part one) flight planning began in earnest. The schedule that worked best for us to do this Alaska trip was in conjunction with the July 4th holiday. Work had been pretty nutty, so we decided to spend a couple of days in Colorado to decompress and celebrate our daughter’s birthday before launching. At 8200′ MSL the airport was already half way to the 16,000′ Minimum IFR Enroute Altitude for the airway crossing the Rockies. Since we were staying in the mountains, we would be able to get a first-hand read on the day’s weather by just looking out the front window. Mountain weather can be unpredictable, and I have learned to distrust forecasts for the mountains. I have a firm rule of a Noon cut-off for flying in the mountains in the summer. Afternoon heating makes for a rough ride and sick family members. By leaving early (0600) AND using time zones to our advantage, we were able to completely be out of mountainous terrain by noon. Essentially there were four basic route options for us to get from Dallas to Alaska…South, Central, Canadian or North. No matter what route we would take, mountainous terrain was going to be a factor. The Southern Route from Dallas to the West Coast provides the lowest terrain, but added considerable mileage to an already-lengthy flight. The Northern Route had lower terrain, but summer storm systems in the high plains were frequent news stories. Additionally, the terrain, though lower, spanned more miles than the central route. The Canadian Route carried the added the hassle of customs and flying in extremely remote terrain for long periods of time. We liked the recommended practice and once-madatory requirement of carrying a high powered rifle when flying in Alaska. But having a rifle on board and landing in Canada seemed to be a ridiculous amount of declaring and registering…it just wasn’t worth the cost versus the benefit. The Central Route through the Rockies provided a couple of airway routes that had lower MEA’s and threaded some lower terrain. As an additional benefit, the planned airway had an intersection to join the airway very close to the valley we would be using after take off from C08. 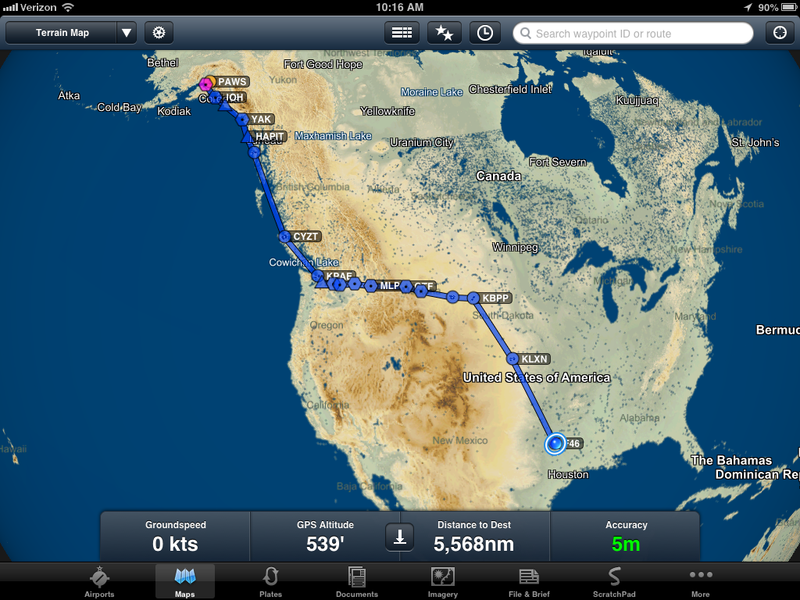 Even though our Bonanza is well-equipped with GPS Navigation, I chose to fly airways for most of the trip West. Airways provided known terrain clearance, back-up navigational aids (yes, I have lost ALL GPS signal before on a flight in IMC) and the benefit of radar coverage available to provide extra safety on case of an emergency. 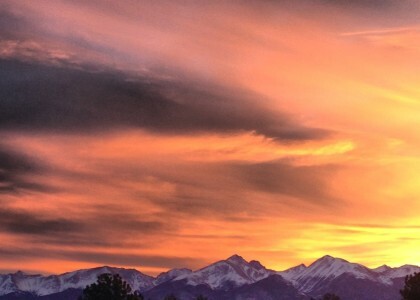 We had back-up alternatives for both the Northern & Southern routes in the event weather prohibited us from using our first route choice of Central Colorado, Utah, & Idaho. We spent huge amounts of time studying approach plates, comparing airports on AirNav.com, calling airport managers to verify that 100LL was actually available, and determining if there would be a crew car so we could grab some food. We were not in a hurry, per se, but the goal was to spend as much time with our friends in Alaska, not explore every city along our route. The Bonanza is speedy and has good range, so if weather allowed, we wanted to get to the Anchorage area as quickly as possible. 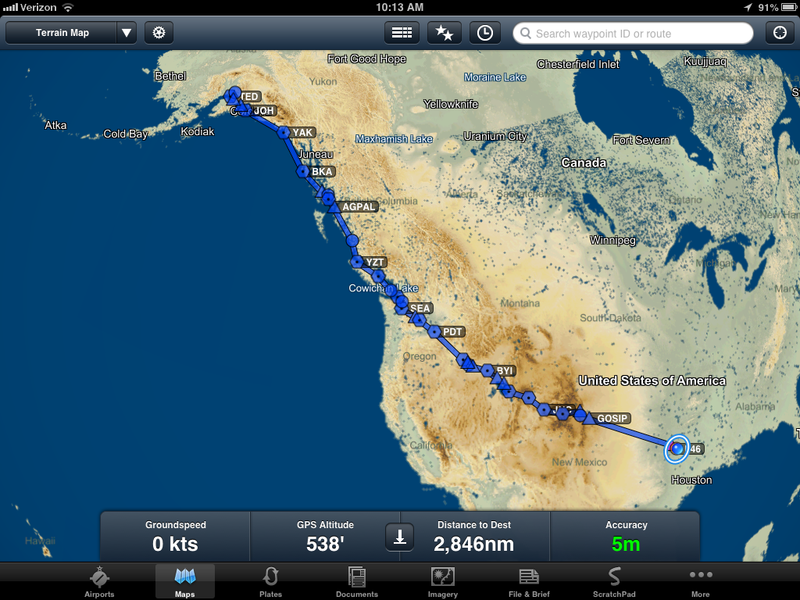 NEXT…I will walk through the actual legs of the flight, fuel stops, learnings, and experiences.